Our Wintergreen honey is delicious straight off the spoon or in a cup of warm water to soothe a sore throat. It has a slight liquorice, peppermint flavour and is not as sweet as some of our other blends. This honey is a specific blend of herbs to help you through the winter months. It includes aromatic Star anise and Cinnamon to provide comforting warmth to chase away seasonal chills. Traditionally used for coughs and colds in Ayurvedic medicine, Cinnamon may also help to clear mucus and ease sinus congestion. Rose hips are a rich source of Vitamin C which is important for supporting the health of the immune system. Thyme’s anti bacterial, anti viral and anti fungal activity can help to “ward off” the season’s bugs. It thins catarrh making it easier to cough up. Liquorice is a “demulcent”, meaning that it has a soothing, anti inflammatory action on mucus membranes – in combination with Thyme, it may ease the misery of coughs and sore throats. Additional decongestant action from Peppermint helps to relieve the “stuffiness” of a head cold and clear the airways. 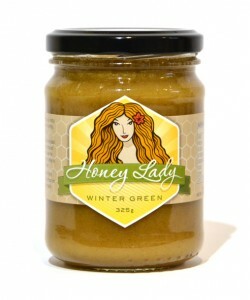 Honey Lady Winter Green Honey is available in 200g, 325g & 700g jars and can be ordered at the Honey Lady Online Store or from one of our fantastic Honey Lady Stockists.